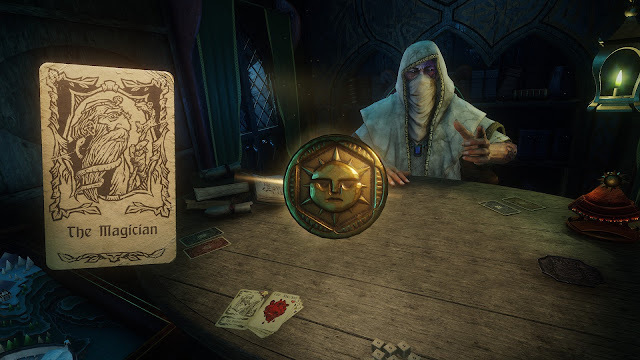 Hand of Fate 2 continues a pleasing trend I have been seeing lately - sequels that improve upon the original while taking chances at the same time. The original Hand of Fate was a fantastic mashup of ideas that worked far better than I had initially thought it would, and Hand of Fate 2 adds depth and nuance to existing mechanics while providing some new ones to the mix as well. 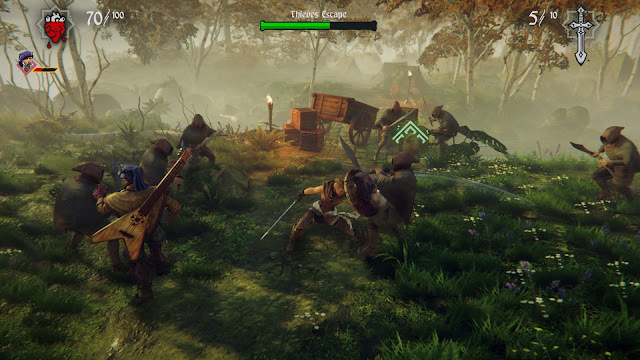 Far too often I see sequels that take two steps back for each forward, but Hand of Fate 2 hops merrily forward with its unique blend of genres from the first game, but better balancing them while adding to them. The result is an entertaining mix of board and video game that still relies heavily on luck, but now offers greater reward for skilled players as well. The premise is an interesting one as a man with a scarf-like mask and aged arms starts to talk to you about a game - a game he has been playing for a very long time. This game in theory helps to determine who you are. If there is one quibble, it is that decisions often lack any truly meaningful carryover. The format here is more akin to a board game in that aspect as you assume a role for the duration of your specific challenge, but there is very little carryover. You don't keep items, blessings or other gains from one session to the next. Instead what you do is complete smaller challenges within each stage and in doing so unlock new cards that can be added to your deck. This deck serves as the foundation of the gameplay in Hand of Fate 2. You pick a mission, and that mission comes with some default cards. The chosen cards from your own collection then get shuffled in, and set face-down on a table as you move about. Move to a new card, and it flips over and reveals an event. Some of the events are negative, some are positive, many are fluctuating depending on the theme of the stage. For example, an early mission involves gathering blessings and finding a priestess while navigating remote, snowy plains. Some of these cards therefore can damage you with a blizzard, but they may also reveal someone buried in the snow. You can then choose to take their weapon for yourself in hopes of better equipping yourself, or digging them out and hoping that you gain a blessing of some sort. This is great as it tries to paint some moral statements about your character, but the next time you roll up the same or a different match, none of that carries over. The exception to that rule, is when you a complete a specific task on a card. That is because it can unlock other cards or items that can be pulled later. Maybe you complete a task that allows you to find / buy a better sword in the future or maybe gives you a new card with a future goal, creating a sort of quest string in the process. These are some of the coolest moments in Hand of Fate 2, because they add a nice sense of progress that does carry over from mission to mission. Further providing that board game aesthetic is the card drawing / dice rolling mechanic. 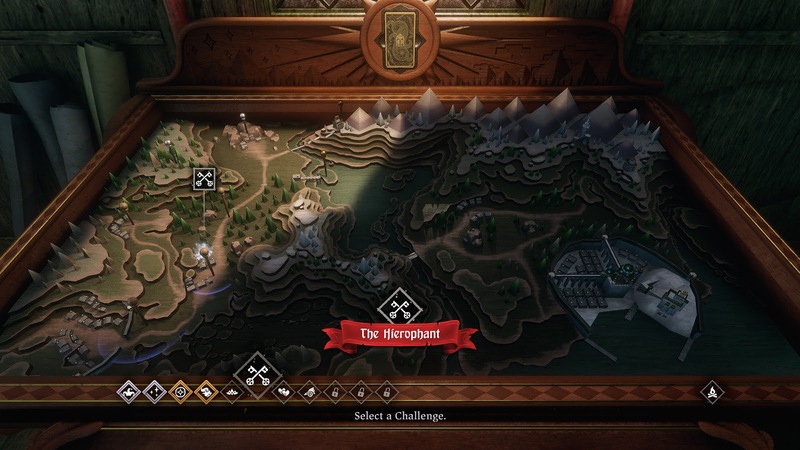 Fans of board games will likely feel right at home here, while those who are not might feel that Hand of Fate 2 slants a bit too much towards sheer luck during these segments. There are events that can occur where you have to pick from four random cards and maybe two succeed, one fails and one has a huge fail - but there's no real skill to them. In fact I just pick the first one every time because I have no real reason not to. Dice rolling is also a pretty sterile mechanic where you are often given an arbitrary value to hit and you may or may not, though there is a bit more control as you can pick up one or more of the dice and re-roll one time if you miss the mark initially. There is also a blessing in there that can boost your dice rolling scores. Another system is the wheel, which is basically just wheel of fortune and you try to 'stop' it on a desired result. It's visual, it generally works well but is of course not overly precise in its stoppage so as to have some element of luck and unpredictability involved. All in all, these systems do take some of the skill out of the game, but they are far from deal killers as the biggest challenges in Hand of Fate 2 revolve around combat. The Batman Arkham style of combat has become pretty popular over the years, and we find a pretty basic form of it at work here with a system of punch combos where you need to watch your opponents for indicators that clue you in as to whether you should try to counter or evade completely. 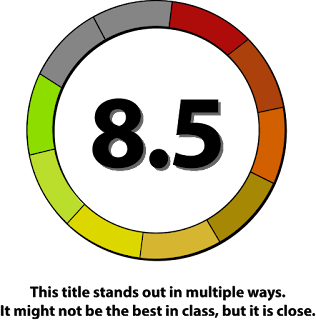 It's all pretty button mashy, but fun and provides a nice change of pace from the more luck-heavy elements of the game. There are some nice subsystems at play here too, such as chaining together enough hits without taking one yourself allowing you to activate a special ability with your weapon. Still, some greater progression and system depth here would be nice, as it lacks features such as learned skills that can add nuance to the combat in a way that the Arkham or Middle-earth games do. The overall presentation works well. The mysterious game master is well voiced, and the graphics have received a nice uptick from the first game. This is a small studio and it shows, with some odd performance hitches that occur now and again (I had the game freeze on my twice, the loading screens feature a somewhat trippy and colorful backdrop but stutters at times while the audio has some moments of odd popping that creeps in when you play enough). None of these are deal killers, but they are slight nuisances that detract slightly from the experience. 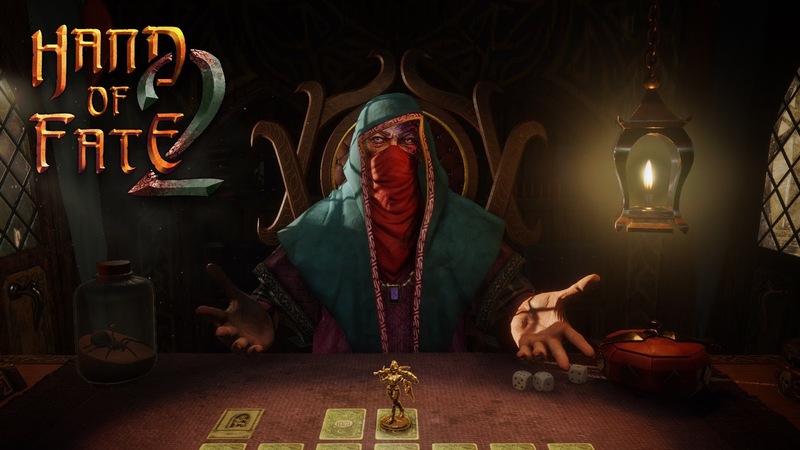 Hand of Fate 2 is a lot of fun as it mashes up action combat with board games and RPGs, creating a unique experience that improves on the original game in almost every notable way. There are some small concerns though, from the occasional performance issue to the hefty reliance on luck to combat that does grow rather repetitive by the time you reach the end of the game. Despite these minor concerns, the overall package comes together surprisingly well for a game with such different parts. The end result is a game that is fun to play more often than not, and one that I hope we continue to see the developers iterate on going forward.